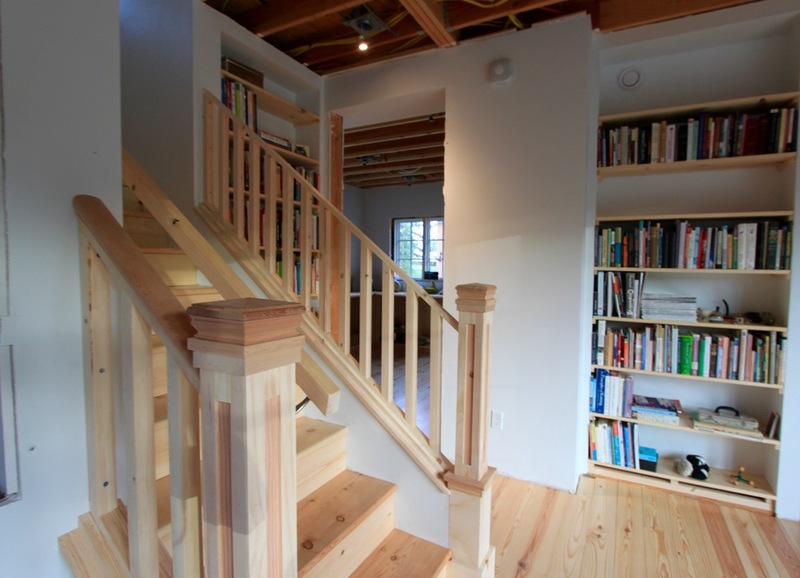 We’ve continued to work on the stairs…the treads and risers are installed, sanded and varnished. Shawn built the two newel posts up and they came out very nicely. They will be painted, so there’s still some work to be done on them. We also began the process of installing the balusters in preparation for the handrails to go on, getting the two sets built and sanded and ready for primer and paint. We also installed a temporary handrail to meet basic life safety requirements, and it really is nice to have it there, especially now that the treads are varnished and slippery in socks. We have a bit more to do, mostly priming and painting on my part, till Shawn can install the final handrails and we can call the stairs completed, but we should make good progress on that this next week. We also installed the shelving for the built in bookcases, got the shelves varnished (really enjoying varnishing!) and brought home boxes and boxes of books (they are friends, really, and the house feels happier with them living here too) to brighten things up. The built ins will eventually have faceplates put on the outside to give a trim to them, but in the meantime, we like the way they have come out. It minimizes our need for furniture (we move a lot!) and keeps hallways open. The height of the shelving really emphasizes the high ceilings. 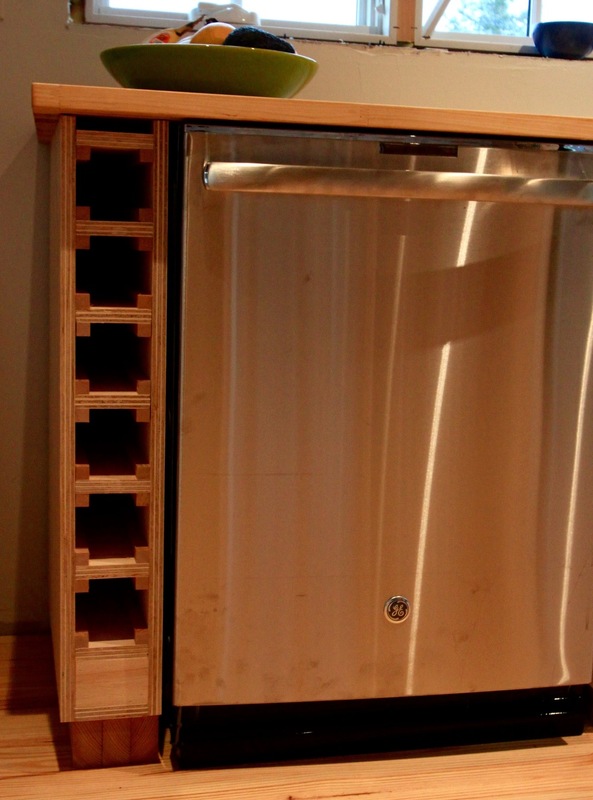 Lastly, Shawn completed the last kitchen cabinet unit, which is a wine rack. We had a tiny space left after the dishwasher on the north side of the kitchen and puzzled over how to complete it, the wine rack seemed to do the trick. We have not yet bought a bottle of wine to test its virtues, but perhaps that will be in the somewhat near future. 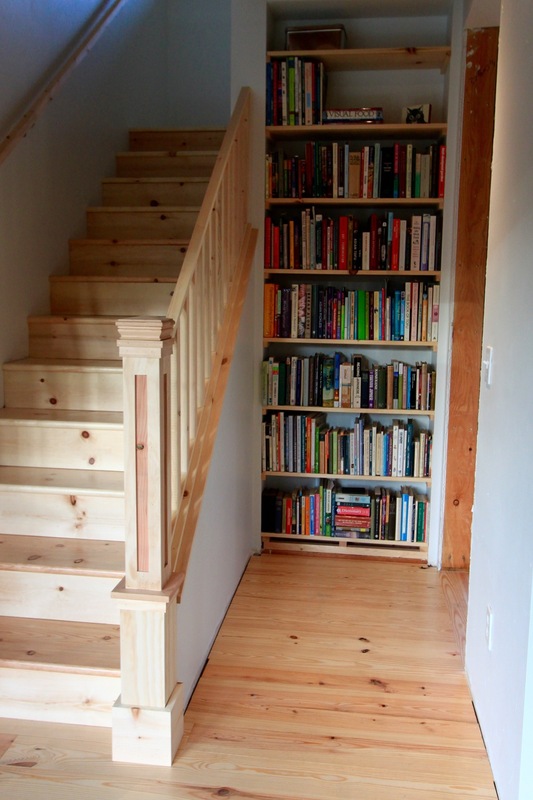 Next on the list, we’ll be diving into our next delivery of trim wood. Shelving for the kitchen cabinets in on tap (no doors yet…saving that) and moulding throughout the house. Also, window trim material is coming, so there may be a bit of that to show - there’s always big satisfaction in seeing the ragged edges of drywall covered up and window sills in place. Our last big interior projects, still waiting in the wings, are the installation of the first floor ceiling (a tongue in groove pine), trim priming/painting, and building the kitchen cabinet doors.